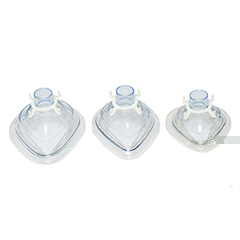 Lightweight disposable masks with comfortable fit on face to increase efficiency of medication delivery. Not made with natural rubber latex. The masks are disposable and for single animal use only. They come in various sizes to accommodate animals of different sizes. For effective delivery of inhalant medication into the lungs. Interchangeable Out-of-Circuit set ups for both large and small animals with 180° rotation mechanism. A closed circuit anaesthetic machine for small animals. Features low operational costs and minimal pollution. Lightweight, portable small animal closed circuit anaesthetic machine that features low operational costs and minimal pollution. The VOC is a continuous flow anaesthetic machine which incorporates a Rotaflush Flowmeter. Portable and come with masks for easy augmentation of ventilation.